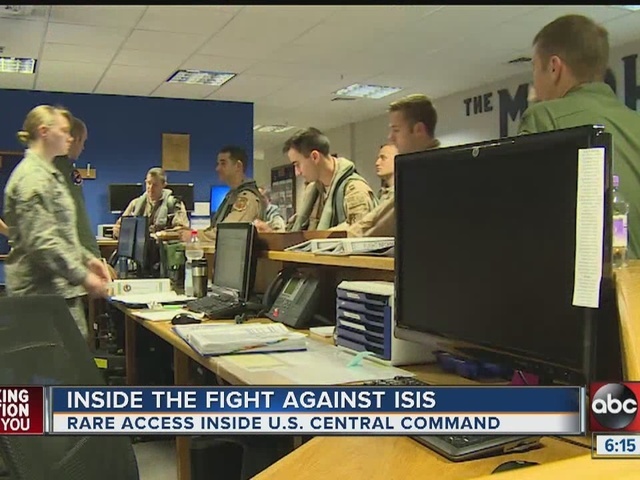 Front and center in the fight against ISIS -- the brain of all military operations in the Middle East is based here in Tampa, Florida. U.S. Central Command is a facility full of our neighbors and friends, with thousands of people deciding how to defeat the world’s most infamous terrorist organization. The questions today: What’s being done and is the strategy working? “On any given day, something that we’re doing in this headquarters is impacting US national security in the Middle East, Central or South Asia,” Colonel Patrick Ryder, US Central Command spokesperson said. Col. Ryder is just one of the nearly 4,000 people working in the highly secured facility with the goal of keeping Americans safe through actions in the Middle East. For the past year, the strategy to defeat the Islamic State has been intense air strikes. There have been more than 8,000, so far. “The idea is to bring pressure on them, to enable the Iraqi’s to take back their territory and also enable Syrian opposition forces to fight ISIL and take back their homeland as well,” Col. Ryder said. Combined with 3,400 American troops in Iraq serving as “advisors,” there have been some gains. Iraqi forces took back the town of Baji, home of a large oil refinery and a town that served as a buffer to Mosul. Mosul is one of the largest cities in Iraq and has been under the control of ISIS for about a year. Kurish forces recently made some gains in Sinjar. About 6,600 square miles have been re-captured by U.S. backed rebels in Syria. “But we have no illusions that this is going to be an easy fight. ISIL has demonstrated, as evident in the attacks in Paris recently, that they are adaptable and they still pose a threat to the international community,” he added. Central Command has also taken its hits. A DOD Inspector General Investigation is underway, looking into whether intelligence reports had been altered in response to an article written by the New York Times. Congress has requested information regarding Central Command’s intelligence assessments. Central Command is keeping the details of those requests secret, for now. Without many troops on the ground, Central Command has been relying on other means to gather intel. Col. Ryder was not specific about what those means are, although a lot of information is likely coming from Iraqi, Syrian and Kurdish fighters. He admitted another ground war with American troops would be faster in taking back ground, but it would not solve the ongoing problems. "Yes, we could put coalition forces on the ground, and yes we could move very quickly. But that territory needs to be held and maintained. The only ones that can do that are the Iraqis and the Syrians. We're enabling them and we're moving at their speed. Ultimately, at the end of the day, to have a lasting effect, that will be the key to success in this campaign," Col. Ryder said.